As more and more people are exposed to psychedelics and the delicate states which they awaken, it is essential that we learn how to provide support for the ones who encounter difficult experiences. "Holding Space" is an experiential workshop where we practice tools and techniques that were developed through years of experience in psychedelic harm reduction and mindfulness-based psychotherapy, discuss the different ways with which psychedelics are changing the world of mental health today, and explore what it means to be mindful for our own inner experience when providing support. Nir Tadmor and Igal Tartakovsky are professional therapists that founded two separate psychedelic harm reduction projects in Israel, and decided to join forces to spread the many important lessons psychedelic harm reduction has to teach us (www.safeshoreisrael.com). During the last year, Nir and Igal facilitated 9 "Holding Space" workshops in Israel and are coming to celebrate the 10th edition in London! Nir and Igal participated in a drug policy discussion in the Israeli parliament, established a psychedelic harm reduction module in the training of paramedics of the national emergency pre-medical services, created a collaboration with the Israeli Society of Addiction Medicine and Holotropic Breathwork Israel, and trained more than 300 volunteers to provide psychedelic crisis intervention services. "Holding Space" is a 2-day workshop where they share the insights, challenges, mistakes and wonders that they encountered along the way. In the workshop they create a space to explore the importance of compassionate listening, loving presence and mindful awareness so that we can provide basic support in times when our loved ones go through a difficult experience. 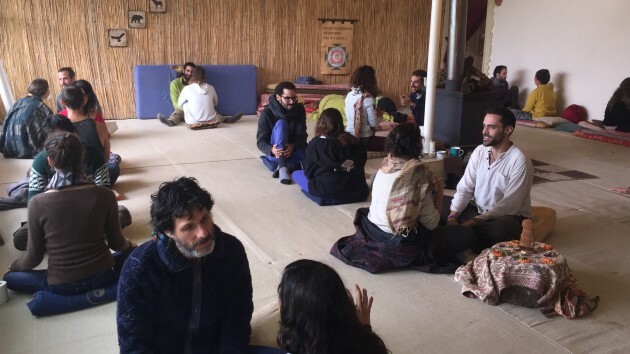 The workshop will give each participant useful tools with which he or she can hold a safe and supportive space for people who are going through difficult experiences, whether it is related to psychedelics or not. * A lecture about the neuroscience as well as the risks behind the consumption of each substance and a discussion about the main principles of psychedelic harm reduction. * Group discussions on psycho-spiritual crises, tools for integration, the importance of one’s own grounding when supporting, and about the shadow aspect of the globalization of these powerful compounds. * Practices in couples and small groups. * A 2.5-hour session of simulations using tools from playback theatre and psychodrama where participants can get as close as possible to hands-on experience in crisis intervention. * Stories from the field. If you are on a low income and need a reduced price ticket, please email events@psychedelicsociety.org.uk with details of your situation. Nir Tadmor and Igal Tartakovsky are leading a psychedelic harm reduction project in Israel called Safe Shore. Through "Holding Space" they shared the knowledge they have gained in the field with more than 200 people who are interested in volunteering as sitters. Since Safe Shore was founded 5 years ago, Igal and Nir supported and supervised hundreds of cases of psychedelic crises both in musical events and in private practice. Igal is a co-founder of "Safe Zone", a psychedelic harm reduction project that has been serving the growing Israeli Burning Man community for the last 4 years both in "Midburn" – the Israeli Burning Man and in smaller community events. He is a Satya coach in private practice and the founder of "Soft Landing" - a project that supports young people on their return to Israel from their common post-army journey abroad. Nir is a practitioner of a mindfulness-based psychotherapy called Hakomi and a Msc. student in Consciousness, Spirituality and Transpersonal Psychology through the Alef Trust where his thesis focuses on psycho-spiritual crises induced by the use of psychedelics. For the last three years Nir has been working as a mental health professional in a center that offers an alternative to psychiatric hospitalization.